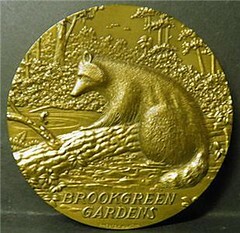 One such competition was for a design to commemorate the 50th anniversary of Brookgreen Gardens in South Carolina in 1981. I immediately took my family on vacation and I spent the entire time holed up making drawings to enter in that contest. And, very surprisingly, I WON - with strong competition from all the well-known established artists of New York and New England! (It was a very attractive $10,000 award that was offered, btw!) For that "win" I must be forever grateful to Mr. Joseph V. Noble, who was equally the Director of the Museum of the City of New York, AND of Brookgreen Gardens! He had the final say for selection of the Brookgreen Gardens medal. (And I was a total stranger to him and everyone else in the field at that time!) Folks, I have been very humble about that selection he made 35 years ago - for all the doors it has opened, and the richness it has brought to my life! 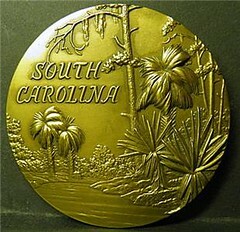 That 3-inch medal design was subsequently enlarged to a diameter of three feet (as per the contest Prospectus) and was placed in the permanent collection of Brookgreen Gardens (1981). It depicts a snail, whose shell is a spiral, sitting on a twisting vine, which is a spiral, and the snail looks out towards a spiral galaxy in space - fulfilling the theme, "The Natural World". (When first set in place inside the Palmetto Garden area, I was bowled over to discover it was just across from a large work of Paul Manship's - the noted sculptor that Miss Gail Hammond had spoken of at the university years before! (see above). Mr. Noble, Brookgreen's Director, then commissioned me directly to do a Membership medal for the Gardens, which was issued in 1984, and is pictured with this story. It shows flora and fauna of South Carolina, with a raccoon on one side and palmetto palms on the other. At about the same time, AMSA (the American Medallic Sculpture Association) was requested to supply a medal for World Food Day, 1984. It was the first time such a request had been made of U.S. artists. Dr. Alan Stahl, AMSA's President at the time, sent the entire membership all the necessary information. I entered the contest - and, very surprisingly, won again! There were no drawings involved in the selection process - only the two finished plasters which were sent to Rome, Italy for minting. The medals were struck in gold, silver, bronze, and aluminum, before world-wide distribution. I later heard from Mark Jones, then Keeper of the Medals at the British Museum, that they had collected a copy. I was astounded to be represented in such a superior collection! I must be forever grateful to Dr. Stahl for "getting the word out" about that contest! I have personal letters from Elvira Clain-Stefanelli, long time Executive Director of the National Numismatic Collections of the Smithsonian, and from Cory Gillilland, Curator of the same National Numismatic Collection, acknowledging my donation of coins and medals to the Smithsonian. Soon after all these events, two openings in the Sculpture and Engraving Division of the U.S. Mint (Philadelphia) became available in the 6-person department - a rarity! Dr. Alan Stahl, then Curator of Ancient Coins at the American Numismatic Society in New York City - and President of the American Medallic Sculpture Association - again disseminated the notice to the entire membership. The job announcement and application form arrived in the same mailing, and, when I studied the job description, I kept shaking my head, thinking, "I could never do that!" The job application lay on my desk for several weeks before, at almost the last minute, I filled it out and mailed it in to the Mint. A few days later I had a long-distance call from Elizabeth Jones, then Chief Engraver of the U.S. My application had gotten their attention and I was to bring actual samples of my work - plaster-work, bronze medals, and painting - for my interview. (They wanted to see a bit of everything I did). Ms. Jones selected two of her Engravers to sit in on the interview and review my work. These two were Edgar Zell Steever, IV, and John Mercanti. Together, the three of them selected me as one of the two new Mint Engravers! My head is still spinning with the excitement and disbelief I felt at the time! (Steever and I later were assigned to do a commemorative coin together - for the White House, 1792-1992. He sculptured the Mansion for the "heads" side, while I did the portrait of James Hoban - original White House architect - on the Reverse).